MAG AND BOO AND THE KIDS TOO! I am so glad we took Collin to see his Great Grandpa Houser before he left. Grandpa went home today to be with my mom Margaret Grange and his wife Grandma Houser. This is a happy day for Grandpa Houser he is rejoicing in the plan of salvation and his righteousness . He endured to the end a great example to us all! We will see him in the next life ! Be happy for him as you shed a few tears! 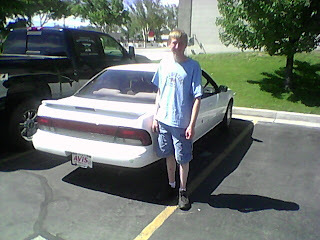 Parker has been working on his Eagle project at The Girls Home in Mantua Utah. He has been digging out all the old concrete wooden benches to prep it for a new concrete pad to cover the whole fire pit area. He has been working with the Missionary assigned to Camp Mantua Bro. Lemon. Above one of Parker's fellow boy scout helping brake up the concrete. Below Mark, Meg, Sariah . Mark taking the wooden bench off the old concrete forms. The girls helped load the old concrete into the bed of the truck to hall away. Triumph Youth services Boys has also been Helping Parker with his Eagle Project. Hopefully Parker will be done before school starts. It has been a great learning experience for Parker. Hard work can be very rewarding. Not to mention he can be destructive in a constructive way. 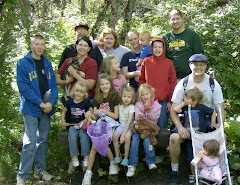 The week before Collin left on his mission was packed with all sorts of extended family fun. We went camping with Mark's family in Idaho at Buena Vista Sand dunes. We had fun making memories with the cousins. Sadly Darn, ugh, I left the Sim card for the camera home. So no pics of the Gibby family camp out. My dad was up from Arkansas for Collin's farewell. We all wanted to spend some time with grandpa. 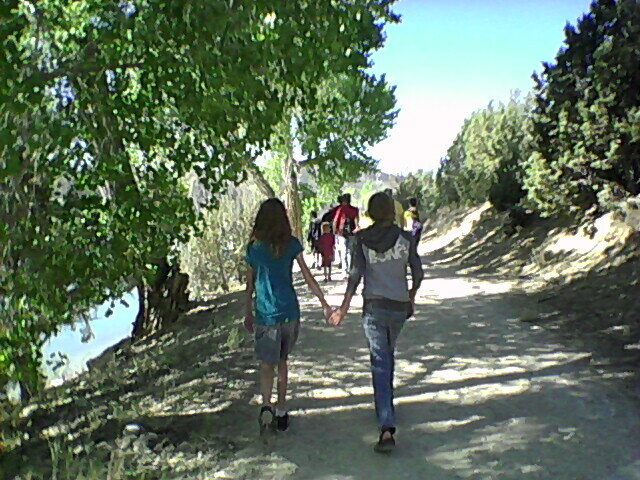 We , my sister Christel my niece Ireland Collin parker Sariah meg and I went to Pine view reservoir. Above Sariah was so brave she kayaked all by herself for the very first time. She did a great job. Below Collin and meg in a kayak together. Meg loved it she was not afraid at all. In fact she wanted to go all by herself and row. Maybe next time we told her. Above: Cousin Ireland, Grandpa Grange and Meg enjoying the Beach. Below: Collin and Grandpa Grange. Below: My dad Grandpa Grange. We all know how hard it is to tip a kayak if you have ever been. Well Grandpa succeeded. He was fine, but not his "new" glasses they now reside in the bottom of the reservoir. Mark and I took Collin through the Brigham City temple in June. 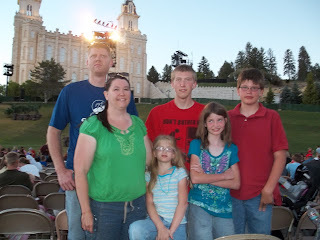 We had a great excuse to go as many times to the temple as time would allow with Collin before he left on his mission. 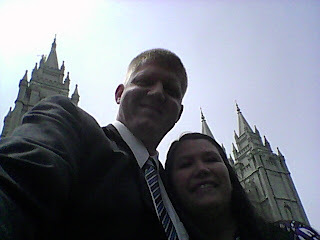 Collin had his Farewell on July 17th. He did an awesome Job on his talk. I kept thinking after his talk wow he has grown up tons this is not the same Collin he was a year ago he is ready to be a missionary. Collin got his mission call. He has been called to serve in the Seattle, Washington mission. He leaves for the MTC July 17 2013. When Collin opened his letter and I read Seattle WA., my first thought was of my belated mother Margaret. My mother so loved the Seattle WA. area. My dad tried for years to get a job there unsuccessfully. I spent a few fond family vacations to Seattle as a kid. My thoughts again turned to my mom, well mom in my heart I said you never got to live there and you were so drawn to Seattle guess you had a hand in sending your grandson there from beyond the veil. As these thoughts quickly crossed my mind I really felt my mom that evening confirming what I thought and she was there in our family room that day as Collin opened his call and read Seattle WA. I was so glad Collin was called to serve in the states. My mother was a very social loving person she helped many people come back to the fold with her pure unconditional Christ like love. Every ward she lived in the relief society always gave her the quote hard ones to visit teach. She had a way to about her that she literally loved them with friendship. 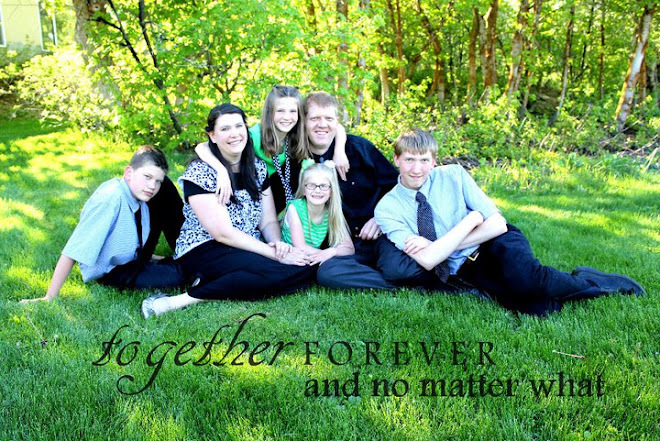 She truly was a great member missionary. She could not go to Seattle in her life time as she was drawn so she sent her grandson to finish the work she felt left undone in Seattle. I was not ready for him to go foreign and to learn a new language thanks mom for putting that heavenly plug for your grandson and letting me know this is where the lord truly wants him to go. Collin Graduated May 29th 2013. I think he had senioritis about 6 weeks before graduation he was just ready to be done. He is excited to leave for his up coming mission. We he returns in summer 2015 he will be attending Utah State University in Logan Utah fall Semester. Summer has come to an end :( The kids are all back in school. I actually am not excited. I love having my kids around, sleeping in, and going on family adventures. This is a monumental school year, Collin will be graduating this year ! I am not ready for him to graduate. It makes me sad our family life will never be the same. It is the last year we will all be together as a family! So we have planned a trip to Disneyland over fall break our last big vacation together as a family before Collin goes off to college and then his Mission. Not excited for this School year ! Collin and Parker Shooing at the shooting range. First and only time ever the Boys got to go to camp together with their Dad. The troop 124. Mark is in the back row on the left in the Green. Camp! We hiked a gruelling 32 miles in four days. Our ankles and legs were covered in dirt.It was hot .We were serinaded and sung to by our boys Alex, Zac,Trevor, and Bryan almost the whole time. They sung song after song enteraining us while pulling he hand carts. It was tough, but I would do it all over again no question. I know the Gibby family knows they can do hard things especially with faith. Meg and I hiking up the road. It was a cool day. It sprinkled the whole time we were hiking. We came home a little damp. I think I would not mind a little rain on the trek as long as it was not at night. I have hiked in blazing sun and rain. I like rain better. Rain cools you down. At the end of the Perry canyon there is a really cool old mine at the end of the trail head. Mark is again loving taffy. Mark and the kids at the entrance to the Old mine. Below is me, Beckee, with the kids at the entrance to the mine. We have had a really fun time together as a family preping ourselves for the Pioneer Trek. We (meaning Mark, Collin, and I) leave for the Trek one week from today. We are excited to finally be going, having six month a prep work involved. I hope we are ready spiritually and physically. It is going to be a grueling monumentous task to walk 28 miles with NO SHADE in four days. The theme for our trek is "..Have faith in me, then will I make weak things become strong..." ETHER 12:27 I know we are all going to have times on this trek when we sttruggle. Remebering this theme will help us to remember we can rely on our heavenly father. We have walked, and walked prayed, and trained for months we now need to have faith in the lord for then after all we have done he will then make our weekness strong. Collin and Meg....Collin found this old TV on our way back thought it made a good picture memento of our fun times we have had training for Trek. This is one steep hike up hill all the way Short, but brutal! We found some shade rested and ate dinner than hiked back down! Sariah and Mark enjoying taffy on the way down! here are our june highlights. 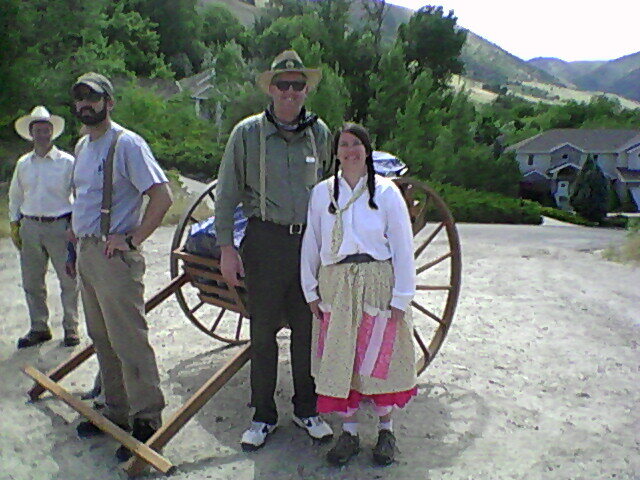 Manti pageant with Mark's Family! We have been asked to be a Ma and A Pa for our stake pioneer trek. We have been training and getting ready. 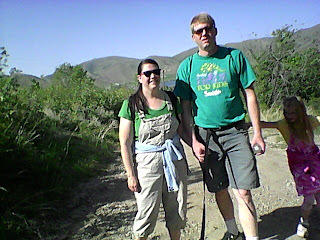 Mark and I have been walking and walking here we are walking up to the girls home in Mantua Utah. 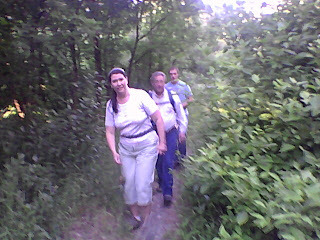 Me, Beckee, Hiking again in prep for the Trek with the young Men for mutal night and our bishop, who will be a trail boss on the trek. 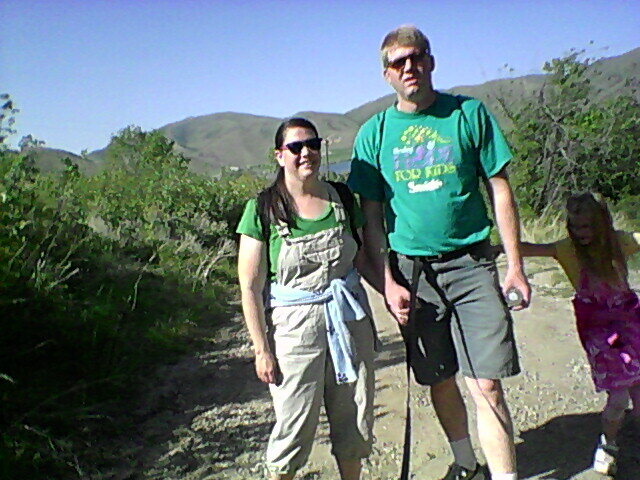 Introducing Ma and Pa Gibby Trek training with the stake! Hiking again in Manti, Utah around the campground lake . Sariah and Cousin kelsey Walton. Mark and I at the Salt Lake Temple for my cousin Ane Houser's wedding. It was nice to take a break from the hiking and training for the trek and spend a day with my mom's family. I love being around my family joyous day! Only 18 day left until the trek hope we are ready! The longest yet we have hiked is over 9 miles, but we weren't pulling a hand cart. Can we do 30 miles in less than 4 days! Sariah nature girl and critter catcher! 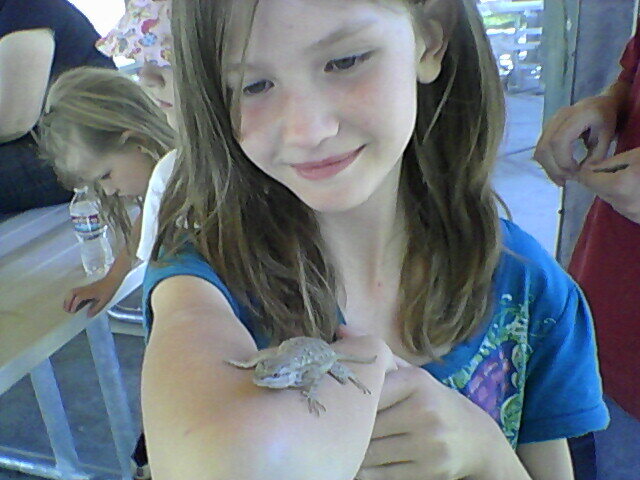 At our family reunion at a camp ground in Manti utah, Sariah caught a lizard a bull frog and little fishes. She caught her fishes with a stick she attached a cup to the end of it. Just look how much she just adores that little creature that just bit her cousin Desiree on the chin! 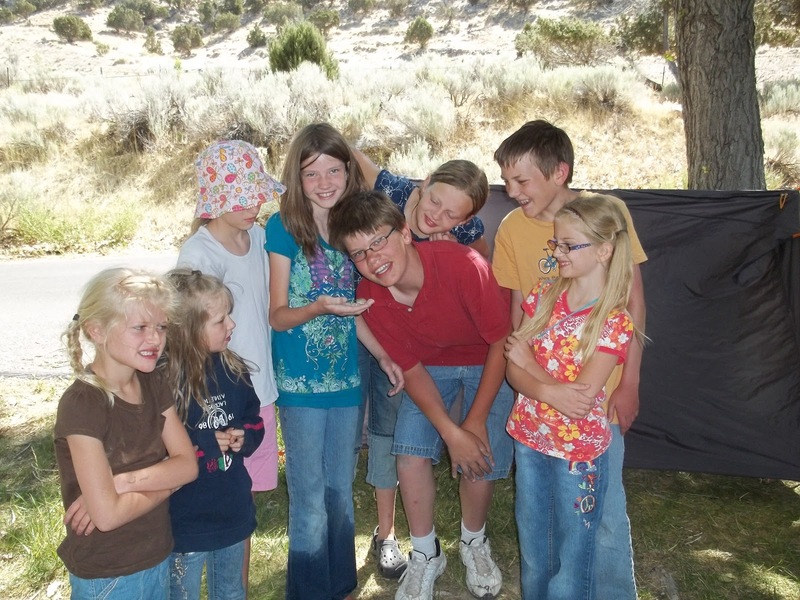 Sariah's cousins from left Desiree, Katie walton, Natalie, brother Parker, Joseph, and sister Meg all looking at Sariah's bull frog she is holding in her hand. Sariah with (left) cousin Kelsey walton, Natalie, and Katie Watlon looking at the fish in the cup they just caught. Happy Easter Easter 2012. I love taking the kids pictures at Easter time to see how much they have grown over the past year. Meg has the most noticable growth on her, but all of them are just going to have to be feed less so they will stop growing ! Collin Almost 17 the leader of the pack. I love this pic it is Collin's personality shining through. Love the Hair. My man Parker 13. A teenager at last. Sariah my dear heart, emotional one! Meg our spark that lights it all in the color she chooses of course. First "real" snow fall of the season was in March this year. We had some snow this year but not much. Collin had fun learnig how to drive in the snow coming home from work the other night in a blizzard. It was good experiance for him. He made it home safe, and had fun he said sliding a little bit. My tulips are coming up and we had 6 inches of snow fall in todays. The kids Parker, neighbor Brady, Sariah, and Meg had fun buidling a snow man in the backyard. Check out that cool grass beard! Parker has become quit the babysitter. He gets calls all the time from the neighbors to go babysit for them. He loves be able to save and have some money of his own to spend. Parker got glasses this week. We have to go pick them up on Monday. Sariah and Meg have been accepted into a charter school in Perry. They will be starting Promontory next fall year. Sariah is excited. Her best girl friend will also be going as well. We hope Meg will be able to get more hands on experince and more help with her behavior problems. She is a lot like Collin we are sure she has ADD like him. It is sad to have your first grader visit the principles office! I just love this picture of Collin sitting on the fireplace doing his homework while trying to stay warm. Collin is a great kid with a strong testimony of the Gospel. He is a hard worker and always gives 110% in what ever he is doing. It is a privelge to be his mother. Every fall year when it is the first snow fall of the year, we celebrate with a snow party. We make some sort of Snow man treat to eat. 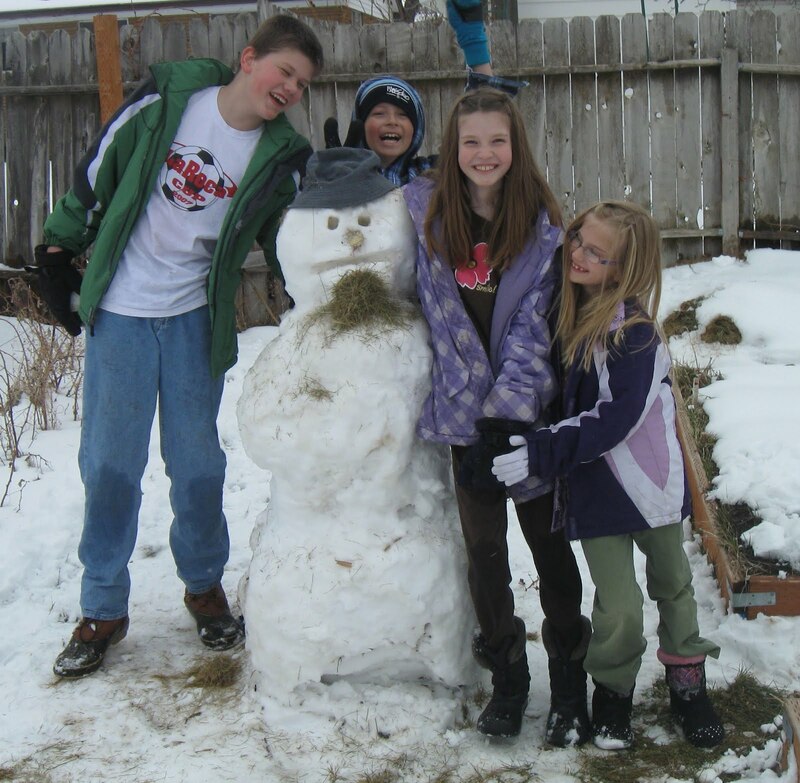 This year we made giant Snowman, sugar cookies. We frosted them and decorated them to look like frosty the Snow man. Then we watch a movie and we eat our snow treat with hot Cocoa. My kids love this tradition we started when Collin was just a little kid. They can't wait to have the first snow fall to celebrate! I love making memories with them. These are the kinds of things they will remember as adults. I still remember every year at Christmas time when I was young kid, going to grandpa Houser's to decorate a tree in remembrance of my Great Grandma Nanny. Nanny loved Christmas so much she would leave her tree out all year long . At Grandpa Houser's all the great grandchildren would decorate a small tree to remember Nanny. Then we would make Christmas trains out of candy. I also remember every New Years Eve we would have a glorious party with homemade donuts Grandpa Houser made. I hope someday I can celebrate the first snow fall with my grandchildren, while my kids reminisce of the day the had theirs. This is what mark did for six weeks. Since he was not allowed to walk on it. What we believe: "Families can be together Forever"
Hanging out at the Perry Park with cousin. Food, is there any more! No My way or not at all! 20 years ! marriage to my best friend! It's me the blog author! Take a picture of us mom ! 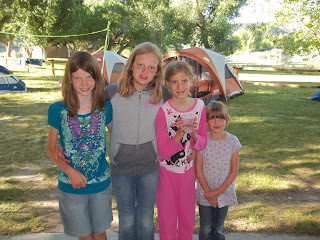 WE WENT CAMPING WITH MARK'S BROTHERS' FAMILIES AND HIS SISTER'S FAMILY IN LOGAN CANYON WE HAD A FUN TIME. PARKER CAME OUT DRESSED AND READY TO GO IN THIS OUTFIT IT WAS SO FUNNY ALL I COULD DO WAS LAUGH AND SENT HIM IN THE CAR WEARING THIS COLORFUL OUT FIT. TAKE A LOOK AT THE SCOKS WITH HIS SANDALS. Utah Deal Diva: Helping Utah families live on less! LET"S GET THIS PARTY STARTED! Mark and I have been married for 19 years. We love to get together with family and friends to chat or play games.Mark has a hobbie of fixing up our home. Mark built on a 600 square feet great room with a bathroom to accomodate our family and friends.I have a hobby of ...I think my kids are my hobby. We have four kids: Eagle scout collin 15, Parker 11, Sariah 8, and Meg 5.